For decades there has been a controversial debate over how far religious faith communities are specifically engaged in ecological practices (EP). Therefore we studied four Austrian and two German Benedictine monasteries religious ethics and spirituality as a means of a driving force for initiating EP. We draw upon theories of organizational learning processes and capacity-building of sustainability to interpret our empirical findings. The majority of monasteries are highly engaged in EP, initiated either as an outcome of individual activities or through a specific mostly informally acting group, but rarely an organizationally or systematically integrated goal of the monasteries, or a focus of capacity building. Monasteries follow a technical and economic decision-making process in implementing EP. Spirituality plays a limited role in the initiation of EP. The environment of monasteries–acceptance or critique against ecological practices–influences the monasteries decisions. Institutionalization of ecological practices into the monasteries organizational structure is rare. A correction to this article is available online at https://doi.org/10.1007/s10806-019-09770-7. What are the concrete ecological practices (EP) with respect to agriculture, energy, forestry and food consumption and how do the monks perceive them? How does capacity building and organizational learning occur in monasteries with respect to EP? How do spiritual rules impact the initiation and facilitation of institutionalizing EP, i.e. is there any connection between ethics, spirituality and EP? What drives the engagement into EP in religious communities? Vonk (2011: 220), who investigated the relevance of values in decision making processes in religious communities, concluded that four principles are important to achieving and maintaining a viable quality of life, including sustainable practices: 1. A consistent and transparent worldview; 2. Strong social capital; 3. Reflective change based on values; and, 4. Good leadership and an appropriate decision-making process. Djupe and Hunt (2009) confirmed that social embeddedness is much more relevant for the engagement into ecological practices than doctrinal or religiosity measures. For Vonk, these principles ‘may stimulate a reflective change towards sustainable development with a lower impact on the environment’ (ibid: 233). These observations underline that the organizational structure, access to information and knowledge of sustainable practices and opportunities for reflective learning processes (i.e. capacity building of religious groups) might influence change in human-nature relations, and thus a new understanding of ecological practices in a spiritual context. To analyse how sustainability takes place in monasteries, we combined Jänicke and Weidner’s (1997) capacity building approach to sustainable practices with Mintzberg and Westley (1992) concept of a cycle of learning process in organizations (see Fig. 1). We adapted and extended these to the conditions of Benedictine monasteries by adding a spiritual dimension and related adopted routines and habits (or consuetudines) (see Table 1). The dimensions of capacity building as drivers for an organizational learning process. The model describes how institutional dimensions, i.e. related frameworks, influence individual and group decision processes (hierarchic, heterarchic). These dimensions can be understood as drivers for the (non-) adoption of EP. Individuals are the agents who activate the organizational learning cycle (stage I) and confront the monastery with convictions (stage II) and concrete practices (stage III) that finally lead to organizational change (stage IV). This perspective allows us to understand monasteries as changing organizations in a complex interplay between individuals and the monastery, adopting new knowledge, and adapting to a changing environment. Thirty-five semi-structured interviews and twelve participatory observation visits were undertaken in six Benedictine monasteries (four in Austria and two in Germany).3 The interviews lasted between 60 and 150 min and were targeted at both monks and employees who were from the area surrounding the monastery. Topics included personal information on the monk/the staff person, the monastery and the monks perception on how the monastery takes social, environmental and economic aspects into consideration in its practices and the monks perspective on the future of the monastery.4 We explored all the EP related to sustainable/organic agriculture,5 as well as food consumption, sustainable forestry, and renewable energy. Interviews were recorded, transcribed and coded in terms of: dimensions of capacity building; organizational learning; and, ecologically relevant practices. Results were discussed with each monastery during a final workshop. The discourse of environmental sustainability i.e. ecological practices, has taken two prominent directions. One path covers an issues-based environmentalism that relies on technocratic, legal, scientific, policy-oriented foundations; the other concerns an ethics-oriented environmentalism that has a value based ethical, religious or spiritual foundation (Smith and Pulver 2009). The latter has received increasing scientific attention within religious and spiritual contexts (e.g., Besthorn 2002; Gottlieb 2008; McDaniel 2002; Taylor 2004, 2016; Taylor et al. 2016a, b; Brock and Barham 2015), and also can be understood as a critique of weak sustainability, which focuses on short-term economic features (Ayres et al. 1998; Beckerman 1995; Neumayer 2003; Zagonari 2017; Davies 2013; Upward and Jones 2016). Ethics and sustainable practices have been analyzed from several perspectives: a human-environmental perspective; an economic perspective (Hussain 1999; Dahlsrud 2008); a consumer perspective (Beekman 2008; De Tavernier 2012; Jacobsen and Dulsrud 2007); and with respect to climate change (Gardiner 2004; Hayward 2012; Metz et al. 2007) and political challenges (Bulkeley 2001; Giddens 2009; Gough and Shackley 2001; Green Cross International and the Earth Council 2002; Ikeme 2003; Vonk 2013). Research programs have explored the potential contributions of religions thought to achieving sustainability (e.g., The Forum on Religion and Ecology 2006),6 and many see these perspectives as offering a new dimension of sustainability education.7 Research that integrates the different perspectives remains relativly limited. Many researchers see religions as classical social institutions that have historically offered advice in the form of norms, rules and values to help individuals and society develop long-term sustaining communities (e.g., Gottlieb 2006). However, there is no coherent picture in thecurrent literature that documents the exceptional position of religion in fostering sustainability. Moreover, the environmental behaviour of Christian faith communities is critically discussed by many scientists. Lynn White Jr. (1967) argued that the Judeo-Christian teleology is the basis of inherently negative effects on environment (see also Djupe and Hunt 2009: 670). White stated that ‘present increasing disruption of the global environment is the product of a dynamic technology and science ‘…’ which is deeply grounded in Christian dogma’ (1967: 54).8 Taylor, Van Wieren and Zaleha confirmed in their review over 700 qualitative and quantitative studies, that until today White’s critique continues to have explanatory power’ (2016b: 1007). In contrast, since the 1990s several authors argued that „the world’s religious traditions are becoming more environmentally friendly“, a standpoint which was summarized under the term „greening-of-religion hypothesis” (Taylor 2016). In the literature, detailed information on concrete sustainable practices and their relationship to spirituality in religious movements is limited. However, to get a better understanding of the systemic nature of sustainability in a contained religious community like monasteries, there is need for more information between spirituality and real-life issues such as food procurement, economic viability, living situations, etc. While social scientists have studied religion in the context of modern societies and their respective challenges (Barz and Luckmann 1992; Douglas 2009; Gabriel and Reuter 2004; Knoblauch 1999; Krech 1999; Luhmann 2002; Turner 2011), monasteries, which can be seen as unique religious living communities, have been studied rather infrequently (e.g., Inauen and Frey 2008; Inauen et al. 2012; Inauen et al. 2010a, b; Rost et al. 2010). There have been even fewer studies of monasteries in the context of sustainability (Carroll 2012; Feldbauer-Durstmüller et al. 2012; Tredget 2002). That environmental sustainability can be a core practice and deeply related with religious values and spirituality, beliefs and convictions is demonstrated by the Green Sisters, a US Catholic movement (see Taylor 2009). They show that this link could be established by referring ecological thinking to the monks’ theologically traditional Catholic roots. They engage in an ecological lifestyle in which they apply their religious convictions (Taylor 2009).9 Their religious orders practice what is called “re-inhabitation”. To live the idea of re-inhabitation includes well-known concrete, sustainable practices such as organic farming, eating vegetarian food, or using energy saving methods. They understand this engagement as an obligation to protect nature and non-renewable sources, and to increase biodiversity and energy efficiency. It is part of their spiritual practice, or a method of daily mindfulness (Sarah Taylor 2002: 239). Thus, they combine technocratic with a spiritual environmentalism. Smith and Pulver (2009) also documented in their analysis of 42 religious-environmental movements in the United States that the majority of these groups see themselves engaged in an ethics-based environmentalism grounded in frameworks that tie God with nature and emphasize action, community, and justice. But how these movements practice sustainability remained unclear (see also Ellingson 2016). Benedictine monasteries are one of the most prominent monasterial faith communities in Europe. Some of them have survived economically for many centuries and they still exist and follow their long-standing religious convictions, based on a strong spiritual foundation of traditional sets of ethical principles: the Bible and the Rule of Benedict, or Benedictine Rules (henceforth BR) (Bilgri and Stadler 2004). Written in the 6th century (Tredget 2010), the BR, or the concrete rules described by St. Benedict, represents an ethical framework and a set of rules that still guide almost every aspect of monastic life. Monasteries are the places where spirituality guides the daily practices of monks.10 Spirituality is defined both as the practice or enactment of religious beliefs and ethics (the theological foundation/epistemology), and the reflexive process that brings theory and practice together (Hisch 2011). Benedictine spirituality includes prayer, meals, work, reading and intellectual work, as well as sleeping. That is, it covers all aspects of the monk’s life.11 Benedictine rules offer a framework for a close relationship between spirituality and environmental behaviour. But there is limited empirical evidence that monasteries are frontrunners of sustainable lifestyles. Derkse (2009) argued that Benedictine spirituality can be seen as a source of ecological transformation and that Christian theological tradition and contemporary theologians could inspire ecological responsibility. In this context, the Benedictine principle of ‘stabilitas’, and especially the one of ‘stabilitas loci’ (stability of place or local stability),12 ties the monks to a certain locality and underlines the values as well as their responsibility towards the inherited monastery, including all its property (land, infrastructure and goods) (Rosenberger 2011: 13). This relationship to time and space prescribed by the BR could be understood as facilitators of sustainability (Rosenberger 2011), but is yet not confirmed, except when it comes to the long livety of monasteries as a means of their economy. Following a notion of a monk from monastery A that each monastery is an own cosmos with its own foundations, rules, practices and characteristics, we present the results for each case separately. Our findings are presented below as follows: First we present results how each monastery invests in and what kind of EP they practice. Then we describe the circumstances under which innovations in EP took place, their institutionalization, capacity building and related learning processes, and technical and economic factors influencing the engagement on EP (see Table 2, “Appendix”). The last part of each case informs how far spirituality and the ethical foundations of the monasteries are relevant drivers for the initiation and institutionalization of EP, or play any role within the broader context of monasteries sustainability discourse. Table 2 (“Appendix”) summarizes additional information. EP was started in 2003 with organic farming that was guided by a secular farmer from the region. The monks also established a biomass plant, fuelled by wood chips from their own forests on the monastery grounds. In addition, they try to purchase local and organic food as far as possible, and follow a vegetarian diet. One person, a monk (A3), in collaboration with a secular farmer, an economist and a manager, responsible for all business issues, initiated EP in this monastery. Acting as an informal team combining different knowledge sources and competencies in the monastery, they established a stepwise diverse EP. The widespread acceptance of organic farming in the region of the monastery, the background organic knowledge of the hired farmer, as well as his strong network with the organic farming community to exchange technical information and collaborate on technical matters, supported the development of this initiative. The economic conditions of the 400 ha farm, access to subsidies and diversified marketing strategies explain why the monastery authorities accepted organic farming as a future-oriented sustainable strategy. The farming activity and other ecological investments in the energy sector went relatively smoothly. But transformation in food procurement toward more regional products, and organic and vegetarian based recipes was a difficult process, that that required an information and learning process involving all members of the monastery EP. A4 summarized that the monastery tries to act sustainably, but largely was not front and center: ‘We don’t believe ourselves to be the main pioneers, but a monastery rather FOLLOWS the trends (A4); [‘naja, ich glaub wir sind nicht die großen vorreiter, aber ein kloster zieht eben MIT zumindest’]. All EP activities have been discussed between the identified individuals, but there was no institutionalized approach, or a shared decision with the majority of the monastery members. Sustainability in this monastery is both a multi-faceted and controversial goal. One monk argued that since sustainability is not grounded in theology, the Bible or the BR, it is not relevant in his life (A4). In contrast, A3, one of the actors for establishing the organic farm explained that there is a strong link between the monastery’s history and sustainability as well as his personal history. For him, the idea of sustainability (described as intergenerational responsibility and acting with regard to traditions [the past], the present and future needs), is deeply anchored in the Bible and the Rule of Benedict (A3). The understanding of sustainability is that of stabilitas (‘stability’). This concept is expressed through the maintenance of the creation, the obligation towards its heritage, and the responsibility for future generations (A4, A5). Others understood sustainability expressed through the economic use of resources and the production of renewable energy (A1, A2). However, while the monks were aware of the monastery’s organic farming, they did not reflect on its meaning or significance. Most were unaware if products consumed at the monastery were organic, from the region, or vegetarian. Brethren and secular stakeholders often argued that sustainability is also seen as the responsibility for the impact of each individual’s activities on the monastery community and the society. In addition, some feel that the idea of sustainability, as well as the idea of economy described in Benedictine Rules, justifies both a non-profit orientation and responsibility for their social environment (A1, A2). In the final project workshop with monastery A, secular and monastic participants confirmed our observations that the monastery connections between Benedictine spirituality and related ethical considerations13 and the decision-making process for sustainable practices are rarely discussed, and that these are more of an individual issue. An institutional sustainability process, through which all members of the monastery are included, and a shared reflection process on how sustainably oriented activities might be in line with Benedictine ethics, did not exist. In this monastery the former abbot and a secular manager decided in 1986 to completely cease farming (B1) in order to resolve an on-going economic crisis; the land was leased to a conventional chicken farmer (B1, B4). It was obviously a challenging decision because of the Benedictine agricultural tradition14 and the personal responsibility of the monks for farming. In contrast, the monastery garden, used to produce fruits and vegetables for the monastery kitchen, i.e. processing (herbs, distillation, etc. ), was reopened for the public in 1996. Production changed toward ecologically oriented flower and herb production and with both public and recreation functions became an issue (Interview: G1 [gardener]). Similar to monastery A, engagement with EP is more an individual rather an institutional activity. Each monk is responsible for his own activity, and is free to invest in, or initiate any sustainability project. However, we found limited interest by the monks, as well as secular employees, to engage in EP. The monastery also neither provides the organizational structures nor guidelines for any sustainability-oriented processes. It was the secular garden manager and the abbot who decided to develop the organic orchard and herb garden, while the majority of the monks disagreed and were concerned about maintenance costs of the garden. While not economically self-sustaining, the garden receives considerable positive public feedback. At the same time, several monks (B2, B4) criticized the outsourcing of agricultural activities that they felt were a traditional part of a Benedictine monastery. The majority of monks had no interest in reactivating the leased agricultural land or in developing organic agriculture. In contrast, there is an understanding of responsibility for the creation, expressed with the principle of sustainability in forestry: ‘only to use that what will regrow’ (‘nur soviel zu nutzen, wie nachwachsen kann’) (B2). When discussing organic agriculture, food, and sustainability, the elderly monks—often with a farming background—were sceptical of organic practices. For them, these practices represent a step back to agriculture as practiced before the Second World War. Any ethical responsibility for an environmental friendly agriculture was never a serious perspective in their reflection. This attitude also mirrors the conservative societal and agricultural environment in which the monastery is embedded. For this monastery we conclude that EP are neither an institutionalized issue, nor is there an expressed interest by the majority of the monks or employed secular individuals. From a spiritual perspective, sustainability, stability, modesty and humility are seen as guiding principles (B1) in daily practices–, something that is intentional (B5) and that makes sense (B4). ‘It’s not only that you give to those who are paying the most, but also to those who deal sustainably with the soil. That is what makes sense, right’? (‘Es geht nicht nur darum, dass du es dem gibst, der das meiste zahlt, [ja] sondern auch demjenigen, der nachhaltig sozusagen, langfristig und auf dauer…mit den böden so umgeht. Dass das einen sinn hat, ja?’) (B4). ‘All the equipment but also the whole property, should be used like holy altar accessories’ (‘Alle geräte und auch den besitz wie heiliges altargerät verwenden’ (B2). These statements mirror a ‘deep respect for the creation’ (‘Große ehrfurcht vor der schöpfung’) (B2). All of these remarks, however, are largely theoretical and do not inform any concrete practices, as discussed above. Although there was some knowledge of sustainability, to link this idea to the BR was not considered. Similar to agriculture, the majority of the monks in monastery B assessed the organic garden activity mainly as an economic risk than an act of maintaining God’s creation. A broader and systematically structured discussion in the monastery on the relationship between spirituality and how to deal with ‘nature’ was not established. We concluded that there is no programmatic and institutionalized process for rethinking the sustainability of the monastery in light of Benedictine ethics and spirituality. The energy system is the main focus of this monastery’s engagement with EP via a biogas plant that is based largely on maize and wheat from conventional farmers in the region and slurry from neighbouring farmers. In addition, they use wood chips from their own woods for their biomass plant, participate in a wind park, a hydropower plant, and installed solar and photovoltaic cells. The agriculture of this monastery can be described as moderate conventional. The decision not to convert to organic farming is driven by assumptions of the leader of the agricultural section who feels that ‘the soils of the monastery’s agriculture are not good enough’ for organic farming. He also feels that there are too many risks in organic farming (i.e., expected yield losses)’ (C1) (see Haidl 2012). Monks regularly communicates with outside partners on sustainability issues. The reliance on scientific and technical knowledge had been key, especially when the monastery established the bioenergy plant and engaged in other alternative energy activities. The monastery’s agriculture and biogas approach is highly regarded in this region that is dominated by intense conventional maize and hog farms. Collaboration with these farmers drives the conventional agricultural approach of the monastery. Organic farming was seen as economically risky on a large scale, but it also does not conform to the local norm. The organic garden on the other hand was seen as less risky, but organic vegetables were increasingly in demand by consumers in the region. Technocratic hurdles (C2) and demand for financial investments to meet EU regulations (C1) (e.g., establishing an own butchery) often hindered further investment in ecological oriented activities. Sustainability processes are discussed and organized through two committees in this monastery: the eco-committee, which serves as an advisory board for ecological questions for the abbot; and, the Dekanien committee that prepares decisions for the abbot. These structures offered a framework for the monks to engage in sustainability activities with the secular employees. Changes toward promoting sustainability were often linked to changes in key positions in the monastery (C1)—for example, the recruitment of a cook offered new opportunities to reorganize the kitchen and menus, which in part influenced the re-orientation towards organic gardening. As the monks see it, creation is a gift and that humans have the responsibility to protect all that God created. In the interest of future generations, respect must be given to those resources that are by nature limited. This standpoint stresses the obligation to care for the creation in the present (C4). Humans play a specific role within creation because of their rational and cognitive capabilities. ‘From an ethical point of view, human dignity obliges us to take over responsibility’ (‘unter ethischen gesichtspunkten verpflichtet uns die menschliche würde, verantwortung zu übernehmen’) (C3). ‘But it is a challenging process to serve creation’ (‘aber es ist eine große Herausforderung, die schöpfung zu bewahren’) (C7). These statements convey the impression that to protect nature is understood as their responsibility. While the implementation of EP was formalized, the discourse about the link between the monastery’s ecological activities and their beliefs was only an informal one. Only the younger monks were more open to radical change toward sustainable practices (C4), and reflect environmental behaviour as part of their spirituality. Also only the younger monks critically reflect on the use of food crops i.e. maize and wheat for bioenergy production (see also Freyer, Bingen, Klimek and Paxton 2015). An exception was also a book written by a prominent monk of the monastery, which refers to the monastery’s activities in using bioenergy to illustrate spirituality in practice. The authors argue the spiritual aspects of the Benedictine Rules and how these rules are translated into EP in the monastery (Grün and Seuferling 1996; Fell 2008). Monastery D operates an organic vegetable farm (D1, D3), is engaged in: sustainable-oriented forestry management (D1, D3, D4); solar energy production (D1, D3; the use of long-distance heating (D3) and wood chips for their heating system (D3). Monastery D argues that sustainability is practiced in everyday activities such as farming, cooking, gardening, and in carefully dealing with creation in general. But there was little explanation why a practice was classified as sustainable. A specific approach of ‘self-sufficiency’ is argued in terms of food production and consumption (D1, D2, D3) through their organic vegetable production. They argue that with the support of European subsidies organic farming is the most economic agricultural approach. In contrast, the animal husbandry unit was outsourced, because it was not profitable (D2, D3). With respect to decision-making processes towards EP, all members of this monastery have the right to contribute ideas. This was confirmed through the practice of sustainability projects built upon individual initiatives. Detailed business advisory board discussions and final decisions to support a sustainable activity primarily followed economic criteria. After acceptance of a project, activities are well planned, integrating expert and scientific knowledge, and guided by well-experienced secular people—temporary (advisors) or permanently employed in the monastery. This is one side of the coin. The other is that the implementation of planned activities was very slow, and there was not much progress towards sustainability for a long time (D1). EP innovations provided by monks were mainly a result of former educational experiences outside of the monastery. The elders tended to be more conservative about innovations in agriculture or food habits. They are coined by the food scarcity after the Second World War and often grew up in farms being trained by the input driven paradigm of agriculture, which is in contrast to the organic farming approach. For example, they insisted on a meat-based diet and were critical of vegetarian dishes. Instead, younger monks educated in sustainability and other ecologically oriented training programs, brought in ecologically oriented innovations such as organic vegetable farming. Additional influence toward sustainable practices came from the temporary employees working as advisors. Thus, this monastery on the one hand, established EP based on individual activities, but the decision and implementation process was an institutionalized activity including expertise from outside the monastery. Sustainability is conceptualized as a combination of the treatment of resources and nature, and the aim to avoid a living that is based on the monastery’s savings (D1, D2). This mainly business argued perspective of sustainability (D1, D2, D4) was shared with the larger landowners in the region. All the interviewees confirmed that sustainability and ‘responsibility for creation’ (‘Schöpfungsverantwortung’) are inherent tasks of the monastery (D1). However, they also noted that there is always a need to balance costs and benefits (D1). The dominant opinion was that the monastery’s economy already fulfils the criteria of sustainability because all activities are oriented to sustain the monastery and to provide a place for living for future generations (D4). D2 argued that the monastery’s economic approach guarantees that nature and the environment stay ‘intact’. In summary, this monastery provided a broad spectrum of sustainable accomplishments often initiated by individuals and accepted and confirmed by the business advisory board. But Benedictine ethics were not interpreted as a source of reflection or a basis to change monasteries’ practices toward EP. Furthermore, there was no strategic plan to invest into EP unless it provides for a better economy in which the ecological or any social impacts seem to be by-products. These are welcomed, but not central to fostering sustainable practices. During the financial downturn in the 1990s, monastery E closed its secondary school and focused on revitalizing its farm, bakery, butchers, as well as adding a guesthouse and woodworking shop (E3). This decision oriented the monastery toward the fundamental sources of life: agriculture production and processing. Supported by this new orientation, the food was slowly converted to ecological and mainly self-produced products (E3). This reform in cooking was supported by an outside expert who advised the kitchen staff (E2). However, this change was also challenged at times and there were disagreements between monks and the cooks (Kern 2012). This monastery is an example in which the impulse for EP, i.e. to convert to organic farming, came from both outside, but also from economic pressure to reset the businesses of the monastery as a whole. It was spawned by a visit to an organic seminar by the monk responsible for agriculture, and an encounter with an organic researcher. Previously, this monk was convinced of the conventional agricultural approach, however, ‘I felt that something was wrong’ (‘mir wurde klar, daß irgend etwas falsch war’)—‘the seminar on organic agriculture opened my eyes of our responsibility for ‘creation’ (‘das seminar über ökologischen landbau öffnete mir die augen für unsere verantwortung für die schöpfung’) (E3). Although the abbot had doubts about conventional agriculture, to make such an extensive decision required the consent of the chapter. Even during the conversion process, many monks questioned the decision because it required overcoming several economically challenging steps. In this process, the on-going provision of information and communication concerning organic agricultural practices was important, because the monastery staff had not been trained in this area. Capacity building in sustainability was not limited to some individuals, but it was a process that included all members. Interrelationships between the monastery and the region were strengthened through open public events, communication on environmental issues, and membership in regional sustainability-oriented organizations. For years, they organized events, such as ‘organic farm days’, working groups on ‘ecology on church grounds’, or handing out flyers to inform the public about their organic philosophy, activities and products. This monastery is of specific interest, because it demonstrates that organic farming and processing of the products (butcher, bakery) is economically feasible while other monasteries remain sceptical of these practices. Monastery E represented the most comprehensive development toward a sustainable lifestyle. Sustainability was reflected in a broad and far-reaching sense; it was not only economically oriented, but combined with the conviction that it must seriously address ‘creation’. It reflects a reciprocal relationship between a ‘spiritual change’ (‘geistiger wandel’) (E2) and the establishment of organic farming. This case also illustrates the result of an individual experience. The monastery itself took up the impulse and started with a reflection on human nutrition and Benedictine spirituality, but at least this initiative was not institutionalized over a longer period. Although there was discourse on Benedictine ethics and food patterns, the monks confirmed that this did not substantially affect the meat-based diet provided by their kitchen and demanded by the majority of the monks. It was also confirmed that their approach is still technically and economically driven, while not intertwined with spirituality. There was a broad consensus among the monks in the final project workshop that the linkage between spirituality, Benedictine ethics and sustainability must be more systematically and deeply reflected in the future. In this monastery farming follows mainstream conventional practices with maize-based cropping systems. The secular farmer of the monastery, comes from the region and argues for the use of organic rules as much as possible (F5). Converting the whole farm to organic farming was not an issue because of economic reasons. In contrast, the woods are managed following strict sustainability standards. Other sustainability-oriented activities, specifically in the energy sector of the monastery, include a hydropower-plant, solar cells, and a wood chip based biomass plant. Furthermore, a plan for a biogas plant was prepared. Monastery F represents a model in which the secular manager, responsible for the majority of sustainable activities, acted in close collaboration with the abbot. The abbot was well informed and interested in scientific information concerning EP. The manager studied sustainable forestry and was engaged in activities dealing with the conservation of nature in the monastery’s forests and in developing a renewable energy concept for the monastery. Nevertheless, an overall concept on sustainability for the monastery did not exist (F2). The monastery’s decision making was characterized by top-down structures, with low participation or even exclusion—specifically of the younger monks or those with conflicting perspectives. It is the abbot who is responsible for the top priorities of the monastery and also responsible for the final decisions (F1). Because the monks comprised a small group that was mainly active in pastoral care, their insights in monastery businesses, but also into issues of sustainability in the development of the monastery, were limited (F1). F1 and F5 also identified a series of internal barriers that hinder the conversion to organic farming: low consciousness of sustainability in the monastery community as a whole; low appreciation/motivation for employees to engage in organic farming; fear of high organizational efforts through converting towards organic farming; insecurity in planning and risks of profitability; lack of subsidies and financial reserves for the conversion period. The perspective of organic conversion would have also consequences for the eating habits (e.g. less meat). This being said, neither the majority of the monks nor its kitchen employees accepted to change their diet towards organic food products (F5). Sceptical positions against organic food by the local people visiting the monastery also had an impact on this decision (F1, F5). The younger monks who were most concerned that organic agriculture remains out of the picture expressed an exception to these opinions. Partly different is the situation within the energy sector of the monastery. Here investments were less challenged by monastery internal discussions, but by the community members, who criticized these activities because of expected emissions and competition with other energy producers in the region (F1). Also the sustainable forest management is a further source of conflict with the local community because it restricts public use. Concluding the institutionalization and learning process of EP in this monastery, there is strong top down decision-making and a relatively low commitment to EP between the monastery and the community, instead there is competition, e.g. on agricultural land. Individual understanding of sustainability, including how monks perceive the monastery’s activities toward sustainability, was controversial. Sustainability was seen as an individual instead of a community practice (F6), yet there was consensus that sustainability was closely linked with the long-term existence of Benedictine monasteries. In the interviews, ‘stabilitas’ was the main characteristic of monasteries’ sustainability. Moderation (‘Maßhalten’) in eating, with clothing or any other goods (‘Güter’) characterized their lifestyles and expressed their understanding of responsibility for creation, but there was no strong link to a broader integration of an ecological orientation. A discourse concerning sustainability and spirituality or the Benedictine ethics formally did not exist. Even the abbot discussed the Benedictine ethics as an orientation on how to establish sustainability in the monastery, it was not included in monastery strategies. We therefore conclude also for this monastery that EP and spirituality are two separate issues and not practiced in a direct relation. The aim of this study was to analyse how Benedictine monasteries are engaged in EP, how capacity building and organizational learning occurs in monasteries with respect to EP, and how EP are linked with spiritual and ethical foundations and convictions. Current scientific debate is controversial about if and how religious groups are specifically engaged in EP, a discourse which is framed by the „greening-of-religion hypothesis” (Taylor 2016). For interpreting the diverse EP patterns and their characteristics of implementation in the monasteries daily life and organizational structure, we draw on a theoretical framework, which combines two theories—the dimensions of capacity building and the organizational learning theory. Monasteries established a wide range of EP mainly in four sectors that are organic farming, forestry, renewable energy and adapted food consumption patterns. Monastery E can be seen as a frontrunner for EP also for the whole region and beyond, specifically due to organic agriculture, processing and the change of diets. Also monastery A is very innovative in terms of organic agriculture, regionally oriented food approaches and bioenergy. Closely behind is monastery C with its high engagement in all kind of bio energy approaches however not always in a sustainable manner, and their organic vegetable production. Monastery F focus is on sustainable forestry and bioenergy, but neither in agriculture nor food habits. Monastery D is limited to the organic garden, while monastery B can be seen as the most conservative in terms of engagement into EP, limited to the vegetable and herb garden, however always under critique by the own members. Impulse and initiation for EP was mainly an individual activity in an interaction, i.e. collaboration with individuals from outside the monasteries or secular employees. With this we confirm that individuals are the main initiators of EP innovations and learning processes and less the monasterial institution as a whole (see Fig. 1). Furthermore, we conclude that the final establishment of EP can be an outcome of an organizational learning process (monastery D, E). If accepted by an authorized council (C, D) the EP innovation will be successfully established at organizational level (stage IV). Such councils do not exist in all monasteries (B, F). Formalized councils as in the monasteries C, D and E are more transparent in their decision making process than the informal in monastery A. In contrast, EPs are endangered, if not appreciated by all members, and supported at organizational level (stage II/III) (see e.g. regional food procurement in monastery A failed after the responsible person in the kitchen changed). Often the decision for a monastery to engage in EP is limited to an economic perspective, that is, based on expected economic benefits. In most cases specifically the younger monks are open for EP, due to their educational background in environmental issues, but also their stronger belief in a narrow relation between spirituality and a respectful dealing with the creation Devine. But due to hierarchical reasons, the access of younger monks to these councils is limited (e.g. monastery F). Elder monks, less familiarized with environmental movements, understand monasteries as a site of spirituality and not as a centre of environmental actors, without realising a link between both activities. Access to information on sustainable practices and technical–economic resources is highly influential for EP activities (compare the cognitive-informational dimension (2) and technical–economic dimension (4) in Fig. 1). 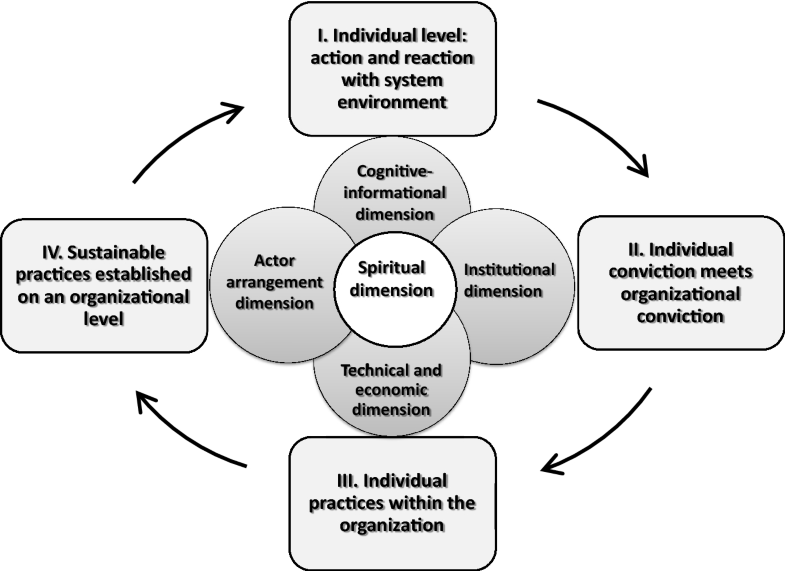 Actor arrangements (dimension 1) initiated by individuals play a key role for initiating EP, but also their degree of integration into the monasteries organization. Socially influential individuals and/or organizations from the region of the monasteries are important drivers for initiating sustainability going beyond a pure economic perspective. This practice confirms the notion of Djupe and Hunt (2009) on social embeddedness. On the other hand, existing contracts or obligations can facilitate or hinder EP activities (in case of monastery B through outsourcing of the farm). We conclude that the economics of EP often dominate the decision making process. At least today, all monastery economies are managed through financial experts. Their responsibility is to secure the financial survival and not to become a site of environmental investments. But indeed the understanding of the meaning of economy is different: (a) a neo-liberal version (e.g. monastery B, D), in which EP are mainly driven by economic advantages (e.g. subsidies), (b) in a socio-cultural context, arguing that what is accepted by society is also economically relevant (e.g. monastery A, C), (c) the long term existence of Benedictine monasteries (mainly all monasteries), documenting that whatever they did was economically advantageous, and (d) arguing that acting ecologically is per see on the long run economically advantageous (monastery A, E). The linkage between spirituality and EP is in general weak (dimension 5), i.e. only expressed by individuals, but not reflected at the organizational level of the monastery as a whole. A reflective process that links sustainability and spiritual values at an institutional level was an exception and only practiced over a limited time period (monastery E) or conceptualized in a book but not reflected by all monastery members (monastery C) and seems to challenge the current monastic self-conception. Only one monastery (E) established an overall ecological strategy at the organizational level that integrated all monastery members (monastic and secular employees) in learning and decision making processes, and systematically developed an ecological approach for all monastery sectors. In the other monasteries, individuals or smaller mainly informal groups understood EP as an activity that should reflect the ecology of the monastery as a whole, but not having the power to make this happen at organizational level. In general EP are not understood as an overall concept that is to establish in all sectors of the monastery, but dependent on individual initiatives and currently available knowledge. Are monasteries specifically engaged into EP, how this engagement is institutionally initiated and implemented, and what might be the role of spirituality? With respect of our six case studies on Benedictine Monasteries our findings are controversial. Following the scientific discourse on the greening-of-religion hypothesis (see Taylor et al. 2016a, b), we argue that the studied Benedictine monasteries follow rather individual pathways as innovators in EP, so we can neither confirm nor reject the hypothesis. It remains an exception that EP is a systematically implemented activity in the organization of a monastery. The societal openness for EP in the surroundings of a monastery might have a certain influence on their engagement. Economic excellence is attributed of high relevance in decision-making processes for or against EP. In this context the monasteries mirror society, where we also find organizations highly engaged and others not engaged in EP. A linkage between EP and monasteries spiritual foundations is less marked, even the ethical and spiritual roots of the monasteries provide a variety of aspects in common with an ethically driven sustainable development. 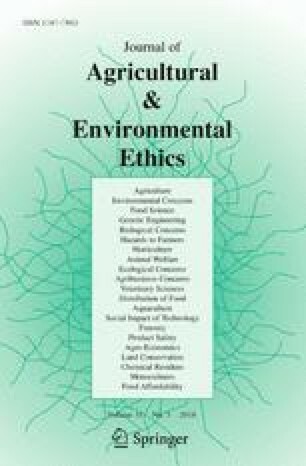 We conclude that with the exception of individual monks or secular employees, monasteries as an organization rarely link ecological practices with their ethical and spiritual foundations. Due to the fact that the majority of the monasteries are struggling from an overall lack of monks and a disproportionate number of aging monks, a monastery’s survival depends strongly on a new generation of younger monks. Thus, the strong interest of the younger generation in a sustainable lifestyle and a strong link between EP and spirituality, which became visible in several of the monasteries, can become a key survival factor of monasteries in the near future. Further research will be needed to clarify the changes in awareness among monks and monasteries as a whole concerning their relationships between ecological practices and ethical and spiritual foundations. Furthermore a quantification of our results via analysing other monasteries and other congregations would shed light on the relevance of our findings. When using the term ‘Benedictine Ethics’, we mainly refer to the normative frameworks that were repeatedly mentioned by the interviewed monks as the underlying foundation of their spirituality, these being mainly defined in the BR and the Bible. Some monks also mentioned the second Ecumenical Council (Second Vatican Council [1962–1965]) as an orientation for their spiritual life. Georgescu-Roegen (2002) discusses spirituality as a key dimension for implementing sustainability at a broader scale. Carroll (2012) is deepening this perspective within the context of religious communities arguing the inherent interconnectedness of sustainability and spirituality. While all Benedictine monasteries are based on and follow the BR and the ethics of the Bible, each monastery creates its own mission and sets of goals and is different in size, economic performance, social and cultural activities, and daily routines from other monasteries (Jonveaux 2011). In order to protect the privacy of the interview partners, we used letters to indicate the monastery (A-F), and numbers for the interviewees (1, 2,…). While number 5 in all letter-number combinations indicates a staff member, all the other numbers indicate interviews with monks. In this context, organic practices are of specific interest because they aim at enabling long-term food production, while respecting both the health of communities and of ecosystems (i.e., their supplying capacities) (IFOAM 2008; International Federation of Organic Agriculture Movements). In this context, organic practices are of specific interest because they aim at enabling long-term food production, while respecting both the health of communities and of ecosystems (i.e., their supplying capacities) (IFOAM 2008; International Federation of Organic Agriculture Movements). (Bergmann and Gerten 2010; Carroll 2012; De Souza et al. 2009; Gardner 2006; Gardner and Peterson 2002; Littig 2004; Rosenberger 2009; Vogt 2004, 2006, 2009). One of the first in Christian history is Saint Francis, who proposed an alternative Christian view of nature and men's relation. He followed the idea of equality for all creatures, including men, for the idea of men’s limitless rule of creation (White 1967: 54). Francis I argued in his Laudato si, that there is need for a fundamental change toward more environmentally friendly behaviour (Francis 2015). He referred to other famous religious personalities, who also took a critical perspective towards human’s environmental behaviour, e.g. Pope Benedict XVI, criticising humans irresponsible behaviour against environment that in the meantime also lead to suffer in the social life. LeVasseur (2014) and Cybelle Shattuck (2016) also confirmed that these faith communities with their own interpretations of Christianity understand and practice environmental behavior as part of their spiritual life. Knowing the BR in addition to the Bible, and reflecting this knowledge through concrete practices, is the basis of all ethical and spiritual monastic life (Hisch 2011). Benedictine spirituality is the classical form of monastic life in Latin Christianity. Inspired by the ideal of the first Christian community in Jerusalem as described in Acts 2-4, Benedictine monks have all in common and live together as brothers under an abbot as their spiritual father. Benedictine life is characterized by what monks consider to be a wise balance of prayer and meals, rest and work, study and personal time. ‘Stabilitas loci’ means that Benedictines remain at the same place and in the same community for their whole life. This physical stability is seen as the condition and ground for the inner stability, the spiritual stability (Rosenberger 2011). Stability means to live in the present a certain way and to prepare for the future. It appears to be a basic element for finding quality of life in spiritual and relational aspects of life, rather than in excessive consumerism (Vonk 2013: 125)(see also Payer-Langthaler and Hiebl, 2013: 225). For example, ethical considerations such as the Rule of Benedict and other Christian ethical frameworks have been mentioned (e.g., the Bible). IFOAM. (2008). Definition of organic agriculture (International Federation of Organic Agriculture Movements). http://www.ifoam.org. Accessed December 01, 2017. Rosenberger, M. (2011). Es sollte genügen (RB 39,1; 40,3; 55,4). Elemente eines nachhaltigen Lebensstils in der Regel Benedikts LiWiRei. http://www.ktu-linz.ac.at/cms/media/w/liwirei_band_2.pdf. Retrieved 25 May 2018. The Forum on Religion and Ecology. (2006). ‘About Us’. http://fore.research.yale.edu/about-us/.